Columns chinese There are 7 products. 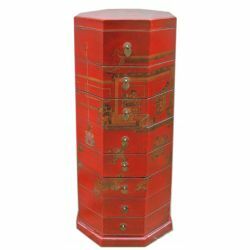 Column chinese octagonal with 6 drawers.Inward bedside tables red container at the end of February 2017Dimensions: L33 x P33 x H84 cm. Column chinese octagonal with 6 drawers.Dimensions: L33 x P33 x H73 cm.